Estonia allows its citizens the greatest measure of freedom of online expression, according to the Freedom House, a Washington-based advocacy group. They have recently published a “Freedom on the Net 2012″report that puts this tiny Baltic country on the top of the list of countries with free internet. 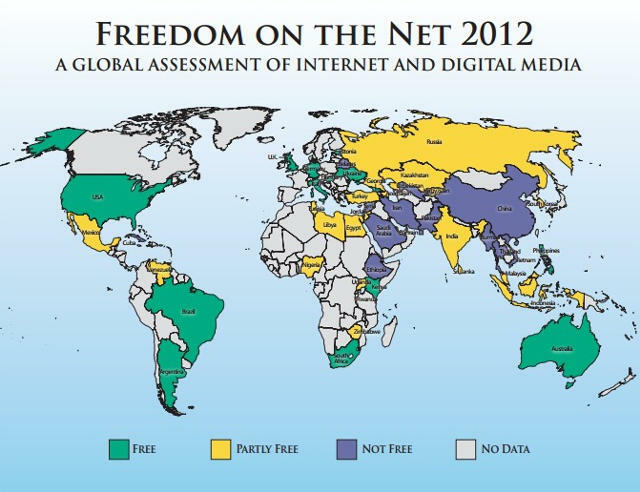 Freedom House’s rankings are based on factors like access to the Internet and free online expression laws. Estonia has a national digital identification system, allows its citizens to vote online, and has announced plans to teach computer coding to public school students as early as 1st grade, according to the technology blog Ubuntu Life. According to the Freedom House, from January 2011 to May 2012 (the period analyzed in their report) the online censorship has grown, although the methods of control have also evolved and became less visible. In 19 out of 47 countries analyzed in the report some citizens who posted content online were “tortured, disappeared, beaten or brutally assaulted”. The report is full of such examples. Physical attacks were not limited to the critics of the government. For example, according to the Freedom House, in Mexico the bloggers who had written about the organized crime were murdered with notes that referred explicitly to the victims’ blog posts. Thailand, Pakistan, Belarus, Bahrain, Saudi Arabia, Vietnam, Burma, Ethiopia, Uzbekistan, Syria, China, Cuba and Iran, with Iran being the less free out of them all. Remember that you can overcome internet censorship with Le VPN, even if you are based in the country which is only partly free or not free at all. Learn today how VPN works. if you are bored at your public areas then you can easily unblock YouTube with the help of using the best VPN that give you access for web user to surf safely that provide you secure ways to unblock youtube safley.